Meru Cabs, India's No 1 cab service launches MeruEve in the NCR! Meru Cabs, India's No. 1 cab service today announced the launch of 'MeruEve' for commuters in Delhi and NCR region. 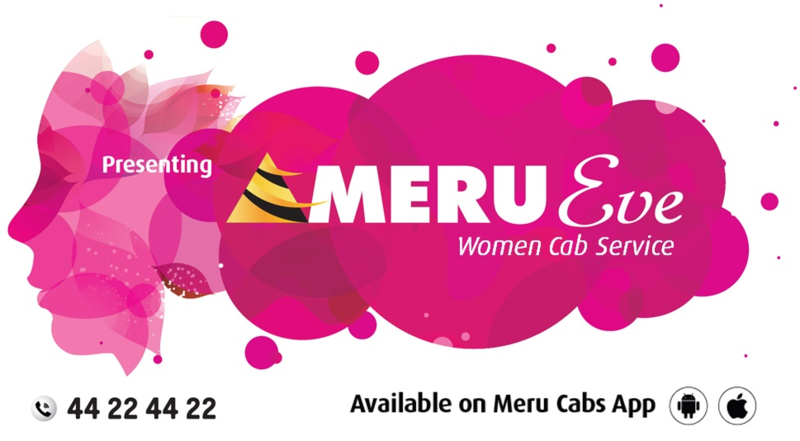 With a fleet of over 12,000 cabs on road serving over 5 million passengers, Meru Cabs now expands its presence in Delhi & NCR by providing commuters especially women a safe and comfortable cab journey with the launch of MeruEve. Launched with the support of the Delhi Police, MeruEve launch event was graced by senior dignitaries from Delhi Police with Shri Bhim Sain Bassi, Commissioner of Police as the Chief Guest of the event. Backed by Meru's superior technology and professional service orientation, MeruEve with its brand new air-conditioned fleet of hatchback cars (Maruti Suzuki Ritzs), will offer passengers point-to-point service, flexibility to retain the cab for a full day multi-stop intra-city journey, or even pay for the period of use. MeruEve cabs will be available to passengers at a standard radio taxi fare of Rs.23 per km. Announcing the launch, Mr. Siddhartha Pahwa, CEO, Meru Cabs said, "Today safety has assumed the utmost importance amongst commuters when using local transport. With an aim to address and provide passengers a safe, comfortable yet affordable travel experience, we are delighted to introduce MeruEve in Delhi and NCR. At Meru, passenger safety has always been pivotal resulting in various technological innovations to overcome security issues impacting the cab industry. Meru Eve is an extension of our efforts and we proud to launch our new service in support with Delhi Police." Branded with a distinct pink bumper, MeruEve from Meru Cabs will be conveniently accessible through its dedicated 24x7 call center 4422 4422, Meru Cabs App (Android, iOS) and also kerb / street pick up. Since inception, like all Meru cabs, Meru Eve cabs are also equipped with GPS, GPRS which could be tracked on a 24X7 basis & additional pioneering features like 'Trip Tracker' and 'ICE' (In Case of Emergency) alert. Booking of MeruEve will be available via the mobile app along with safety features ICE alert & Trip Tracker. Making it more convenient for its customers, Meru's mobile app will enable its customers make a booking, track the progress of their cabs via live mapping. The App was recently awarded the "Best Taxi App 2014" by TripAdvisor, can be downloaded from all the mobile app stores - Android, iOS, Windows and BlackBerry. Meru Mobile App is currently India's top rated and leading cab app in the travel segment of almost every app platform. Meru Cabs, a world class cab service was launched in Mumbai (April 2007) in association with India Value Fund, a premier India centric private equity fund. Meru Cab has pioneered the concept of GPS/GPRS enabled cab service in India. Since its launch, Meru has continued to receive an exceptional response from the customers and is consistently distinguishing itself as a provider of superior quality transport. In December 2013, Meru launched its MeruGenie service in Hyderabad, followed by Bengaluru, Pune, Delhi, Chennai & Mumbai. Now, Meru offers its world-class cab service across 13 cities in India under consumer proposition of Reliability, Safety & Transparency. Recognized by 'The Limca Book of Records' as the largest fleet taxi operator in the country, Meru has completed more than 35 million trips across India. Meru has been voted as India's Most Favourite Cab Service by TripAdvisor Travellers' Choice for 2 consecutive years 2013 & 2014; and also won various other esteemed awards like, Times Travel Award 2011, IT User Award 2008, 2009 & 2010.